The WikiLeaks dumps of Hillary Clinton campaign emails have ranged from titillating insider gossip to more disturbing revelations about the abuse of influence. For her opponents, they’ve been something of a treasure. But beyond partisan politics, everyone should be concerned by what the leaks say about the holes in American cybersecurity and the shifting rules of engagement with Russia. WikiLeaks founder Julian Assange is allied with Russian Premier Vladimir Putin, and U.S. intelligence agencies widely believe it was the Russians who hacked into Clinton campaign accounts. That amounts to a nation state using the power of its intelligence apparatus to influence an American election. And that’s scary stuff, particularly if Putin takes it to the next level of disrupting voting and vote counts. “They can’t do it wholesale,” says former Congressman Mike Rogers, a Brighton Republican who now hosts a TV show and consults with cybersecurity startups. “But if they can create enough doubt in the integrity of an election, they can cause a problem. Rogers sees in the WikiLeaks a “big and dangerous” change in Russian policy. Previously, the Russians behaved rationally toward the United States, he says; meddling in elections brings unpredictability to the relationship. For decades, Russia has meddled in elections in Latin American and Eastern Block nations. But it has not dared to do so in this country. The Russians are our technological rival, with sophisticated cyber ability. If they get serious about this game, they could cut off power to parts of the country, create chaos in financial institutions and ruin the credibility of elections. Vice President Joe Biden made the mistake of warning the Central Intelligence Agency is planning a “covert” response to Russia’s hacking. It would have been much more covert had Biden not blabbed about it, and compromised CIA deniability to boot. Still, the United States must respond. And it must do more to protect itself by finding ways to keep Russia and others out of our networks. The National Security Agency is shackled by a public worried that it would turn its cyber eye on average citizens. It now needs more freedom to catch hacking attempts overseas. That requires the ability to share in real-time evidence of malicious source coding and other suspicious activity. Currently, it takes four days to get the information through Homeland Security, in most cases. By that time it’s often too late to stop a hack. The NSA also must be able to work more cooperatively with the private sector, which controls 85 percent of the computer networks. Most of those private networks, Rogers says, are vulnerable to hacking. Now that Putin has demonstrated a willingness to disrupt America’s sacred democratic process, we need to get ready, and quickly. The NSA and Cyber Command were put under one leader to allow the brand-new cybersecurity agency to use the progress already made by the intel organization. Six years later, the admiral said it’s time to step up and reevaluate if assumptions that were made at Cyber Command’s beginning are still accurate or if the threat environment is different. “It’s a sign of CYBERCOM’s maturation that we’re even having this conversation,” the admiral said. Former Rep. Mike Rogers, R-Mich., said he has “been going back and forth on this issue” and what the right path forward is. The question of splitting the position into two began because people questioned the link between an organization with an offensive and defensive military goal and a civilian intelligence organization, as well as issues of sharing resources. “Would that make both organizations more effective? The only thing I worry about is, now does Adm. Rogers have to talk to Director X at NSA to perform the same function he does today,” the former congressman said. Last month, Sen. John McCain, R-Ariz., and chairman of the Senate Armed Services Committee, promised to block the administration from splitting the job between two people. Donald Dixon is a co-founder of Trident Capital Cybersecurity, a managing director at the firm and a long-time booster of the United States Marine Corps. So much so that when he noticed military veterans having a tough time finding civilian jobs after their tours of duty, he sprang to attention, convincing the U.S. Congress to pass legislation aimed at helping ex-military secure employment. Not the typical mission for a venture capitalist. Dixon served in the Navy from 1969 to 1972, finding himself as an engineering officer stationed on a destroyer during the Vietnam War. His sons followed suit and joined the Marines. Peter Dixon served for eight years with tours of duty in Afghanistan and Iraq, and Andrew Dixon spent four years with a tour in Afghanistan. Both are captains now in the reserves. When asked what motivates him, the elder Dixon has a simple answer: “Patriotism.” But it is more than that. It was the ability to use technology to solve a social problem in the 21st century. Dixon said he became aware of the jobs gap when son Peter had a difficult time locking down a post-duty position three years ago when he left the military. So he began looking at the issue with all the due diligence of a new investment, examining Department of Labor stats. His research uncovered that veterans are 50 percent more likely to be unemployed over time. To Dixon’s surprise, the biggest problem veteran employment reps nationwide have is finding contact information on discharged vets. Part of the problem is form DD 214, the papers that military service members fill out upon departure. Vets don’t receive DD 214 until eight to 12 months after leaving the service. And the form doesn’t include a mobile phone number or an e-mail address. It includes space for a physical address, but many service members don’t know where they are living when they are discharged. So Dixon called the officer at the Pentagon responsible for DD 214 to ask if the form could include a phone number and e-mail address. The answer was “no” since the change wasn’t required by law. Dixon then put an Act of Congress on his to-do list. Call it now a “done” list. Working with former Rep. Mike Rogers from Michigan and Rep. Jeff Miller, Dixon helped create legislation authorizing a pilot program voluntarily capturing e-mail and mobile phone numbers attached to the 2015 National Defense Authorization Act. He didn’t stop there. He helped create a jobs website for veterans, sponsored by Trident Capital. Maybe now the path from active duty to active employment will be easier to follow. The recent hacking of the Democratic National Committee may have made for political drama, and even the departure of the committee’s Chairwoman, but it also raised serious concerns about foreign powers seeking to influence our elections through malicious cyber activity. The most likely suspect is Russia. During his time in power, Russian President Vladimir Putin has implemented a formidable state and state-sponsored cyber espionage and online disinformation apparatus. But hacking is not only effective in uncovering political dirt; it could just as easily endanger Americans in a very physical sense. Consider if you were traveling on a commercial airplane, 30,000 feet above the ground, and all the sudden the captain of your flight announces that your aircraft will have to make an emergency landing because the aircraft’s Global Positioning System (GPS) has been jammed. Your flight has been compromised and your captain can no longer use modern navigational methods. The culprit for the jamming could be a country like Russia, a rogue state like North Korea, or even a terrorist organization like ISIS. Fortunately, an aircraft’s GPS being compromised has yet to be a reality for airplanes around O’Hare Airport, or anywhere else in the U.S. However, it is not unrealistic to think that a rogue nation would use a critical but vulnerable system like GPS as a weapon or a way to intimidate the West. Though our nation’s GPS began as classified military technology decades ago, it has since become a vital resource to the everyday American. Still operated and maintained by the Department of Defense, the system is in need of repair and modernization—more specifically cyber hardening, to ensure our enemies and criminal actors cannot intercept, infiltrate or jam the many critical functions that rely on GPS technology. On the civilian side, GPS has almost countless functions such as helping to plot commercial shipping routes, tracking packages on Amazon, wiring money and finding the nearest Starbucks or gas station. Every time you use your smartphone to help you get directions, you are relying on GPS. For our military, GPS is critical to security and accuracy of functions from locating enemy combatants to ensuring the accuracy of air strikes to avoid civilian casualties. Despite how critical GPS is to the United States, we’ve known that our GPS systems have been out of date for quite some time. That’s why within the last decade the Department of Defense began overhauling and upgrading the entire system. In 2009, a Government Accountability Office (GAO) report warned that our GPS system was close to a breakdown, stressing the urgent need to modernize its infrastructure. Fortunately, a two-part fix is underway. By upgrading our nation’s GPS satellites (GPS III) and the ground systems (GPS OCX), we’re not only improving the system’s strength, longevity, and accuracy but also hardening the system against cyber attacks from foreign adversaries, terrorists, and criminal enterprises. Unfortunately, the progress to develop and implement these complex upgrades has been increasingly delayed and costly. As former stewards of taxpayers’ dollars, that is also cause for concern. However, milestones have been made and the program is on track to be deployed by 2021. In order to keep that time schedule, it is critical the GPS upgrade has continued support from Congress. Today, as lawmakers on Capitol Hill consider defense funding and policy decisions, the future of our GPS satellite and ground system upgrade is unclear—while the House fully supports this modernization, the Senate is calling for funding to be reevaluated based on developmental progress, or cut entirely. While we understand reaching consensus between the House and the Senate can be challenging —nowhere is this more important than when it comes to our national defense. Failure to do so will jeopardize the safety of all Americans, put our military superiority at risk and increase the likelihood that terrorists, criminals or enemy nations will use our GPS vulnerabilities against us. The Honorable Silvestre Reyes, a Democrat, is a consultant in El Paso and is a past chairman of the House Permanent Select Committee on Intelligence. The Honorable Mike Rogers, a Republican, is host of the nationally syndicated Westwood One radio commentary “Something to Think About,” a CNN national security commentator, and is the past chairman of the House Permanent Select Committee on Intelligence. Former Michigan Rep. Mike Rogers has been an FBI agent, state senator, chairman of the powerful U.S. House Intelligence Committee and a syndicated radio commentator. Now the Howell native is adding television producer and host to his resume. 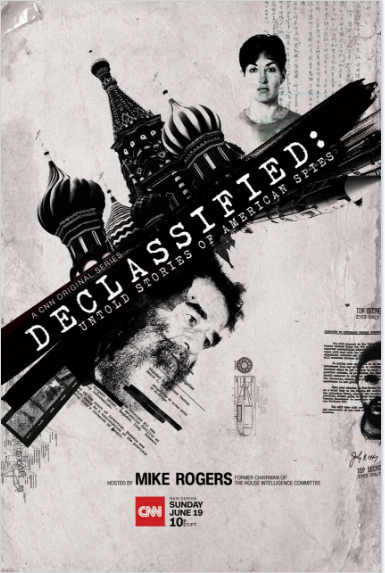 Rogers’ new show, “Declassified: Untold Stories of American Spies,” debuts Sunday night at 10 p.m. on CNN. The eight-part series will feature the stories of former spies with the Central Intelligence Agency who were stationed abroad, keeping close tabs on foreign countries for American interests. Speaking to CNN’s David Axelrod on a recent podcast, former U.S. Attorney General Eric Holder made waves by suggesting that in leaking classified intelligence documents, Edward Snowden “actually performed a public service by raising the debate” about surveillance techniques. Though he was also quick to emphasize that Snowden should face consequences for his illegal actions, Holder’s comments come at a time when the conversation around Snowden is poised to shift — in the wrong direction. The trailer for a new movie from Oliver Stone called “Snowden” foreshadows a tale of an American hero who risked everything for the sake of the U.S. Constitution and the Fourth Amendment protections of his fellow citizens. The villain, in typical Hollywood fashion, appears to be the U.S. government and its supposedly immoral and predatory National Security Agency. Portraying the actions of Snowden and the U.S. government in this way is both outrageously counterfactual and utterly shameful. Before Americans use the trailer to decide whether to pay to watch “Snowden,” they should revisit the facts surrounding his security breaches, as well as the events that directly followed and continue to this day. Read the full piece on CNN.com. Watch the trailer by clicking on the image above. DECLASSIFIED will air Sundays at 10:00 p.m. beginning on June 19.